Quark Soup by David Appell: Guesses For the Update of the Doomsday Clock? Any guesses? There isn't much space left, but I'd be surprised if they can ignore Trump's heedless craziness for even a year, and the contribution of climate change to the hurricanes and wildfires in the US last year. So I'm guessing they will set it forward by a half-minute. 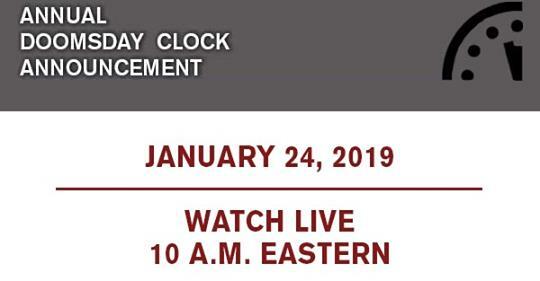 You can watch this year's announcement on 1/24 on their Web site or Facebook page. A minute and a half, half a minute closer to midnight.